Westringia ‘Glabra Cadabra’ is a hybrid whose parents are said to be Westringia fruticosa and a form of Westringia glabra. This hybrid will develop into a dense shrub about 1.5 metres high by the same width. The leaves are glossy and held in whorls of four around the stems. Violet flowers are carried in clusters for many months. In our cold climate garden specimens are seldom without flowers. Both foliage and flowers are attractive features. Light pruning will keep plants dense and encourage flowering. Our plants have proved to be hardy, free flowering and resistant to drought and frost. Established plants have very low water requirements. 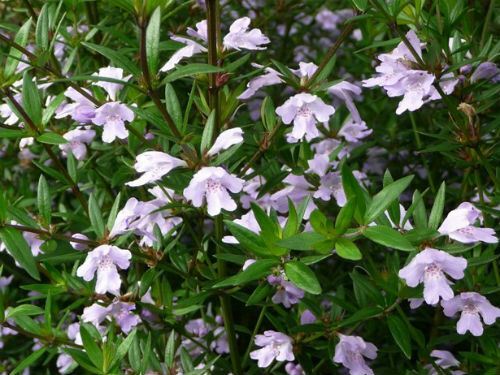 Westringia ‘Glabra Cadabra’ could be grown in low, informal hedges together with other Westringias. A combination of this hybrid with Westringia ‘Wynyabbie Gem’ would create a dense and long flowering hedge.